I admire Great British Chefs' recipes, the way fashionistas admire the latest Jimmy Choo's shoes: I want but I can't have. Or Can I? I am still in shock, after having been asked by GBC to reproduce a recipe of my choosing. After agonising over which to choose, I carefully picked one of their pork recipes: Fillet of Pork with Honey and Sesame Seeds, Carrot and Ginger sauce. This is a bit like a topsy-turvy, before and after, piece. Before photo being above. Great British Chefs gave me a beautifully presented recipe and I give you my version. My dad used to say that you could never reproduce any of the chefs' recipes because the ingredients in a "normal kitchen" are different from these used by professional cooks, even if they tried very hard to simplify. He was right and he was wrong at the same time. On Great British Chefs all the recipes are graded, on the pork section only one is challenging, so it should have been perfectly easy, and it would have been, but for the small matter of "carrot juice". At any given other time, I would have swapped with carrot any kind of juice, but now, I needed the full effect: the look and the taste. Carrot and ginger is a marriage made in heaven, it took me three days and his help so it won't take you anytime. Carrot juice has a very short shelve life therefore it isn't stored widely, if you don't fancy hunting, killing and squeezing carrot, the only solution is the organic food store. It is a little expensive but on the other hand, the whole dish costs just under £10 for 4 people. Needless to say that the recipe lived up to its promises, easy to re-create thanks to the cooking mode. The dish is delicious, the fillet really tender, the sauce a perfect accompaniment, the sesame seeds made it pretty, could easily become a classic. Preheat the oven to gas 200°C/Gas mark 6. Meanwhile, heat a frying pan until hot, add the rapeseed oil and 30g of the butter. Once the butter is foaming, add the pork fillets and fry, turning occasionally, until golden-brown on each side. Season, to taste, with salt and freshly ground black pepper. Remove the fillets from the pan and place onto a plate. Drizzle with the honey and coat well with the sesame seeds. Transfer the sesame-coated pork fillets to a trivet in a roasting tray and place into the oven to cook for 10-12 minutes, or until completely cooked through. While the pork fillets are roasting, peel and finely chop the ginger and then squeeze into a tea towel to catch the juice. Place the carrot juice and ginger juice into a pan over a medium heat and bring to the boil. Cook to reduce to about 150ml of liquid, then slowly whisk in the rest of the butter. Season, to taste, with salt and freshly ground black pepper and set aside. Remove the pork fillets from the oven and leave them to rest in a warm place for five minutes. When ready to serve, carve the pork into thick diagonal slices and place on the centre of each plate. Spoon over the carrot and ginger sauce. 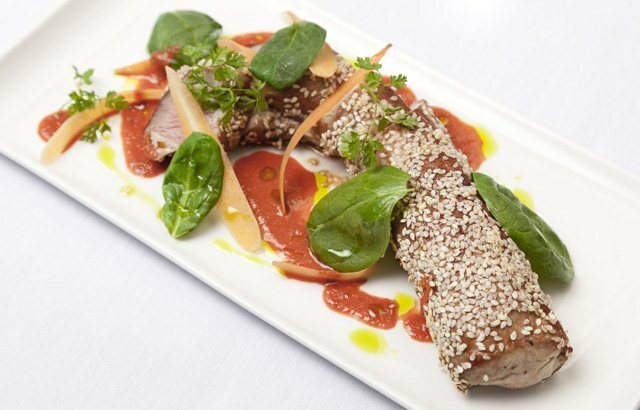 Disclaimer: Pork recipes: Fillet of pork with honey and sesame seeds, carrot and ginger sauce is an article sponsored by Great British Chefs whom I thank for giving me the opportunity to write about and reproduce one of their recipe.